Electromyography remains a main diagnostic tool within neurology. 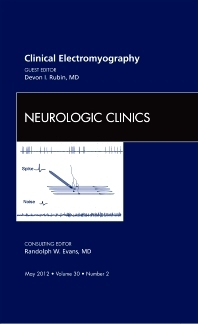 This issue of Neurologic Clinics addresses the most recent developments in the clinical application of EMG. Articles in this issue include: Nerve conduction studies: Basic Concepts and Patterns of Abnormalities; Needle Electromyography–Basic Concepts andInterpretation of Recorded Potentials;Electrodiagnostic Evaluation of Carpal TunnelSyndrome;Electrodiagnostic Evaluation of Ulnar Neuropathyand Other Upper Extremity Mononeuropathy; Lower Extremity Mononeuropathies;Electrodiagnostic Evaluation of Brachial Plexopathies; Evaluation ofRadiculopathies;Electrodiagnostic Approach to Motor NeuronDiseases;Electrophysiologic Findings in PeripheralNeuropathies; Evaluation of Neuromuscular Junction Disorders in the EMGLaboratory;Electrodiagnostic Findings inMyopathy;Electrodiagnostic Approach to CranialNeuropathies; Technical Issues with Nerve Conduction Studies and Needle EMG;andCoding and Reimbursement of ElectrodiagnosticStudies.